This is an annual KCH club event with a long established tradition. It affords club members, former members and members of the public a useful workout before the Christmas dinner. However it is more than just a pre-Christmas dinner workout. Former club members home from diverse parts swap stories and renew acquaintances as they run or jog around the quiet city streets – departing from the Castle Gates on the Parade at 11.00am. There is no charge to take part but participants make a contribution which traditionally is presented to a local charity or other deserving cause. 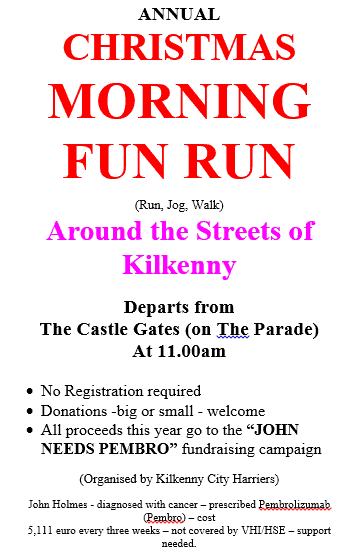 If you have never take part in this make this your year to get out before you tuck in to a big dinner and enjoy the fresh air and breath taking streets of Kilkenny City with friends and family.